Day 05 - Lakme Fashion Week Winter/Festive 2017 Concludes With A Big Bang! 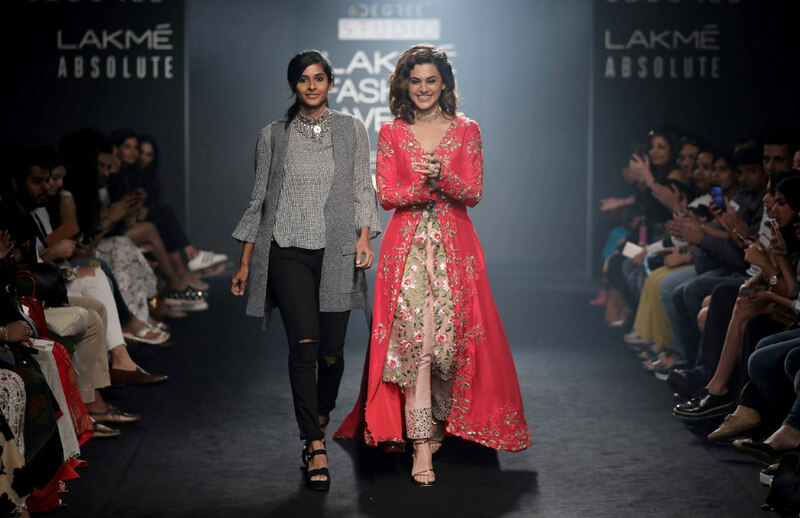 - Wedding Affair var admin_url = "https://weddingaffair.co.in/wp-admin/"
Day 05 – Lakme Fashion Week Winter/Festive 2017 Concludes With A Big Bang! 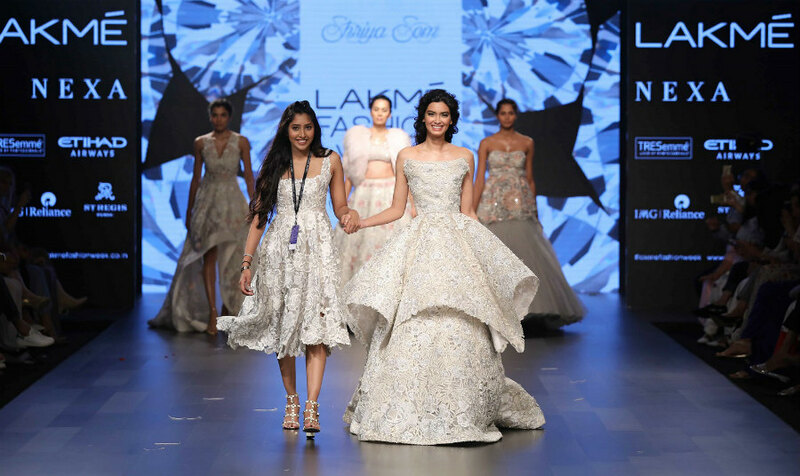 The final day of Lakme Fashion Week (LFW) Winter/Festive 2017 ended with much excitement and ado – and what a day it was! Marvelous collections one after the other brought the runway to life in ways unimaginable – Day 05 was a sight to behold. With every passing second, the fifth and final day of LFW 2017 metamorphosed into every bride-to-be’s dream come true. 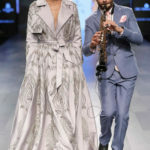 Arpita Mehta, a name synonymous with sophisticated ensembles showcased her collection “Midnight Muse” on the fifth day. It was a graceful line with a festive approach and the collection was perfect for any ‘Red Carpet’ event. Mehta chose fabrics like Tabi silk, georgette, silk, and chiffon among others to create a collection as beautiful as nature. 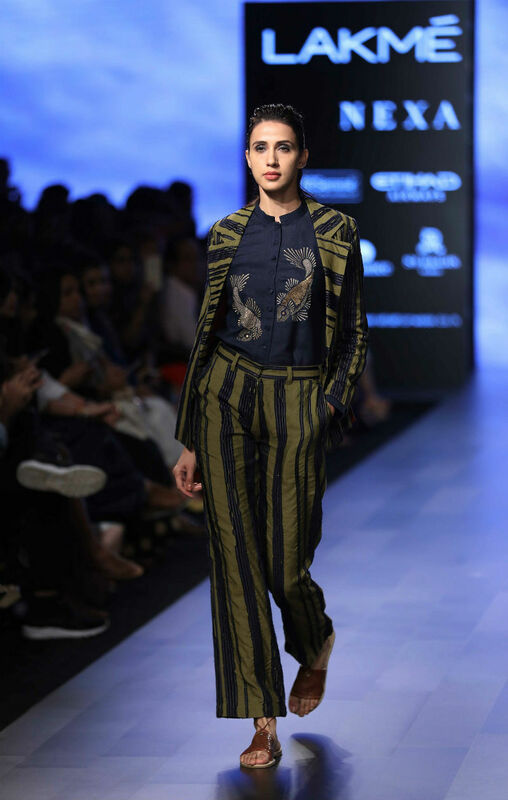 The prints were unmistakably inspired by alotus and it was the focus of attention in most of the looks Mehta had created. Motifs of flora and fauna were also used abundantly in her designs. 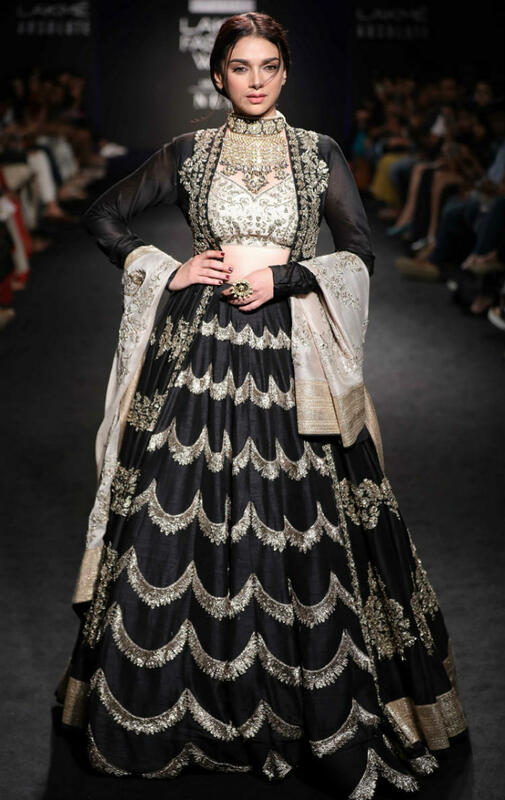 Bollywood’s new favourite girl next door Kriti Sanon looked like an angel in disguise as she walked down the runway in a black lehenga skirt with lotus motifs and an ornate fitted blouse. 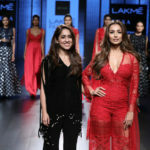 Likewise, couture designer Ridhi Mehra Sekhri’s label “Ridhi Mehra” also unveiled her “Adorne” collection on the fifth day. The collection left everyone spell-bound as it was curated with a lot of prints and embellishments. Keeping the wedding celebrities and guests in mind, the collection sought inspiration from the elaborate designs and crafted interiors of Islamic structures and domes. In her collection, Ridhi who is known for ingenious techniques, presented interesting designs and patterns for the new age ‘Shaadi entourage’. 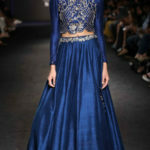 She used fabrics such as Chanderi, pure silk, pashmina, suede and tulle for her layered lehengas, palazzos, cholis with long-tassled sleeves and many more innovative ensembles. 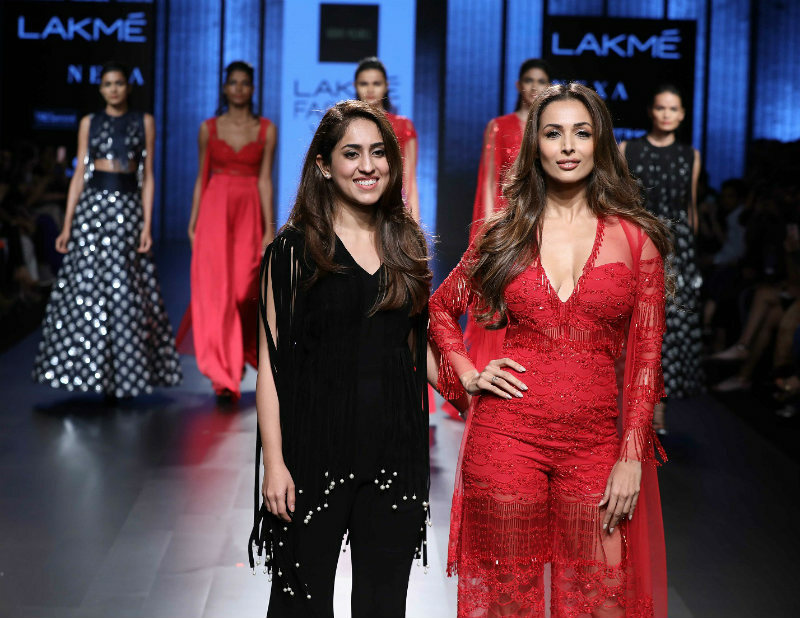 Malaika Arora emitted grace and confidence as she strutted down the runway in a vibrant red jumpsuit with tassels and beaded fringing. 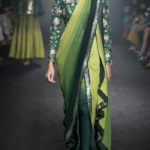 Under their Vineet Rahul label, Vineet Kataria and Rahul Arya presented their ‘Sukhavati’ collection on the fifth day. The fashionable duo made use of fabrics like cotton, Chanderi silk, and tussar silk to create fantastic pieces like a quilted maxi, kimono style jackets, kaftans, cropped pleated blouses and much more. Their collection also consisted of trench coats, kurtas, sarees with highly innovative blouses. The color theme was mix of different shades of red and blue. Shriya Som, a label by Shriya Bhupal showcased its collection ‘Vignette Vista’ on the final day. Som’s collection was a mélange of interesting shapes and silhouettes ranging from midi-dresses to shifts and body-con outfits to power suits and eye-catching gowns. Bollywood diva Diana Penty walked down the runway as graceful as a full-moon night in a layered ball gown in ivory. Sonaakshi Raaj’s collection “Skin” was unique in every which way and so was the runway set-up for her collection. As the models showcased Raaj’s collection, singer, composer and music director Raghav Sachar serenaded them down the runway. “Skin” made use of the PVC style extensively, which helped Raaj achieve a combination of different fashion styles in one creative collection. In a gold embellished jumpsuit complete with a trail, actor Pooja Hegde stopped the show and struck gold while doing so. Jade, the brainchild of designers Monica and Karishma too showcased their collection “Aiyana” by Amoh on the closing day. The duo recreated the cult fashion of the 60s and 70s while giving it an interesting facelift. The collection was a refreshing take on the cult fashion from the past with re-engineered styles of sheer jackets, drapes, flared skirts and much more. As powerhouse of the century and youth icon Ananya Birla took center stage, decked in an ensemble from the collection alongside the other models, the ambience seemed to light up sevenfold. 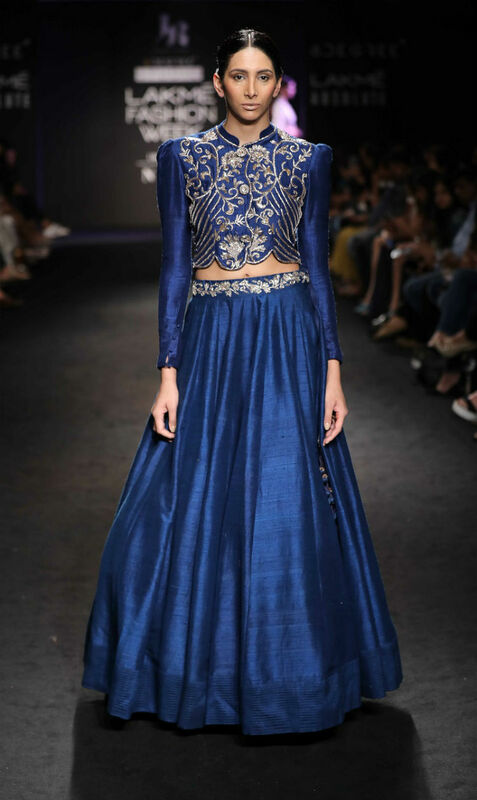 ‘Munna Michael’s’ Nidhi Agarwal had opened the show dressed in a beautiful blue lehenga. 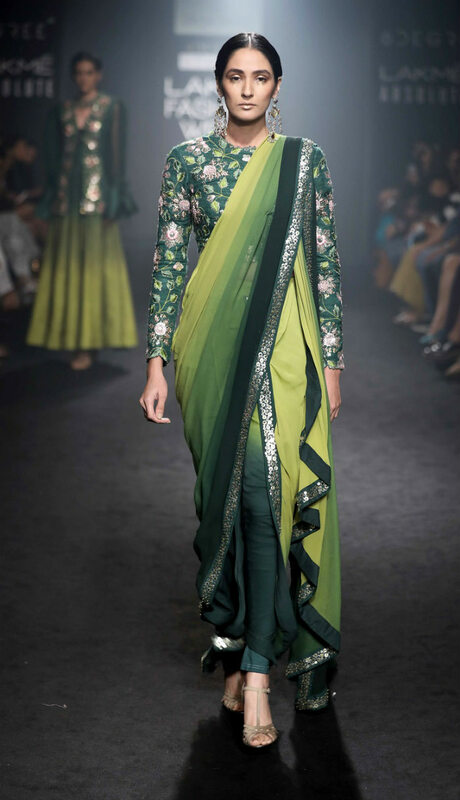 Divya Reddy unveiled her collection “Sage’’ at 6Degree Studio on the last day of the event. Her collection comprised of a lot of ensembles that were the color of lichen and several shades of green. Layered maxi skirts with frills were teamed with body-hugging embroidered cholis of the same color. A hint of reds, blues, browns and yellows also made appearances in her collection. 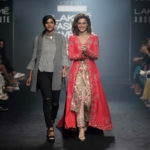 Critically acclaimed actor of “Pink”, Tapsee Pannu looked ethereal as she glided down the runway in a bright pink embellished jacket with long sleeves and flamingo colored fitted-trousers. At the runway at 6Degree Studio, Jayanti Reddy, who is known for her ethnic fusion wear also showcased her collection of ensembles for the festive season. Inspired by the Byzantine period of the Roman Empire, Reddy’s collection comprised of lehengas, shararas, jackets, blouses, tunics, pants and shawls. Golden embellishments were used broadly throughout the entire collection. 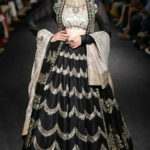 Doe-eyed Bollywood beauty Aditi Rao Hydari looked like royalty as she stopped the show in a flared, balck lehenga with golden embellishments and a trailing Anarkali jacket. 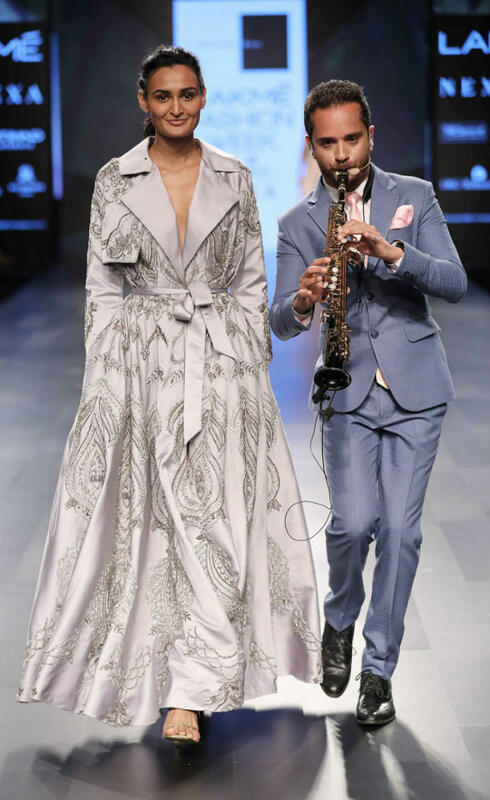 Day 04 of Lakme Fashion Week Winter/Fashion 2017 was a day full of collections inspired from the past and also a glorious day for great collaborations. 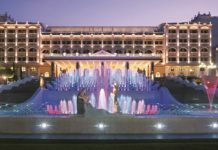 The show saw collections that were influenced by the likes of Johnnie Walker’s striding man and Niloufer, the beautiful Princess of Hyderbad. The runway was set ablaze with Bollywood divas like Nargis Fakhri, Pernia Qureshi and Vani Kapoor amongst others.